Extracting honey from the hive is a very messy process. We extract honey in the fall. 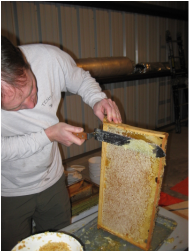 We start by pulling out frames of sealed honey from the hive. We use a smoker because it helps to calm the bees. 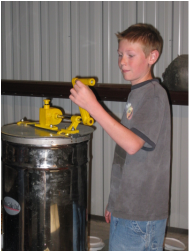 We remove the wax cappings, and extract the honey in a centrifuge. Scraping the beeswax cappings from the frames. Spinning the centrifuge honey extractor. All of the honey will come out of the bottom. 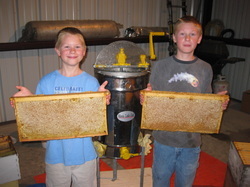 Proud Bees Brothers are holding some frames full of honey.